The Bait Al Aseel villas are homage to the traditional Middle Eastern home, beautifully transported into the 21st century with the luxurious build and amenities you’d expect from an international golf community. The specially textured exterior walls lend an earthy feel of the old-world ‘stone gus’ so characteristic of the region, along with slightly crenulated elevations set with wooden mangrove beams. Bait Al Aseel literally translates as ‘authentic house’ and here you’ll certainly get a feel of traditional Arabian charm – expertly fused with modern luxury. The elegant floor-to-ceiling windows invite plenty of natural light in along with the green outdoors. Inside, rooms are bright, airy and a blank canvas waiting for you to add your signature style. 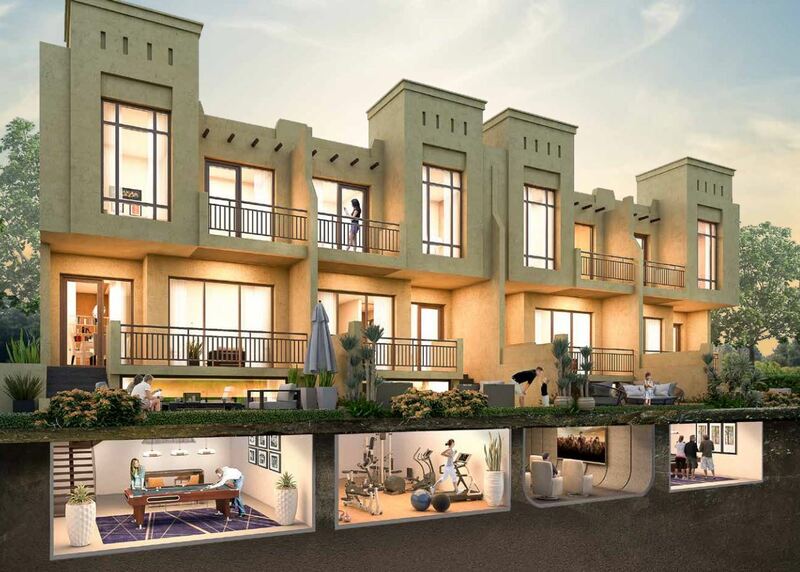 The three-bedroom Bait Al Aseel villas offer the ideal family environment for everyone. With an impressive 2,296 – 2,334 square-feet of space, the villas have a large living / dining area and closed kitchen, three balconies, two parking spaces and a garden. But the pièce de résistance has to be the multi-use lower ground floor area with natural light and the warmth of a traditional family home, giving you space to realise your dreams. Whether you’d like that state-of-the-art home cinema, a studio for dance or yoga, a gymnasium or perhaps a quiet place to paint or a majlis in which to sit and relax, you have an entire room that you can truly make your own. Take life at your own pace in a green community that’s also considerate towards the environment. Many of the amenities are nature-inspired and promote a balanced way of life, yet the community’s location provides easy access to major road networks. This ensures a fast and convenient commute to major business hubs and the city’s attractions.